Last Tuesday, Baseball Prospectus rolled out three new metrics for evaluating pitcher performance - Power (PWR), Command (CMD) and Stamina (STM). I was particularly drawn to the PWR metric, which is described as a way of evaluating how much a pitcher fits into the "power pitcher" archetype. It's an intriguing and novel approach to evaluating and classifying pitchers, I think it's great new lens for looking pitchers. But when I looked a little closer at the 2016 PWR scores, something jumped out at me. As of right now, our Power Score is comprised of these three identifiable parts: Fastball velocity (three parts), fastball percentage (two parts), and the velocity of all offspeed pitches (one part). There are some other factors that we considered when developing this metric—such as the tendency to work up in the zone, and to lean on fastballs in put-away counts—but the current version of this metric only includes the three main components discussed above. While I don't have access to BP's exact numbers used for calculating the PWR, I rigged up a rough approximation using the Pitchf/x numbers available on FanGraphs by normalizing each of the above components and weighing them as described above. 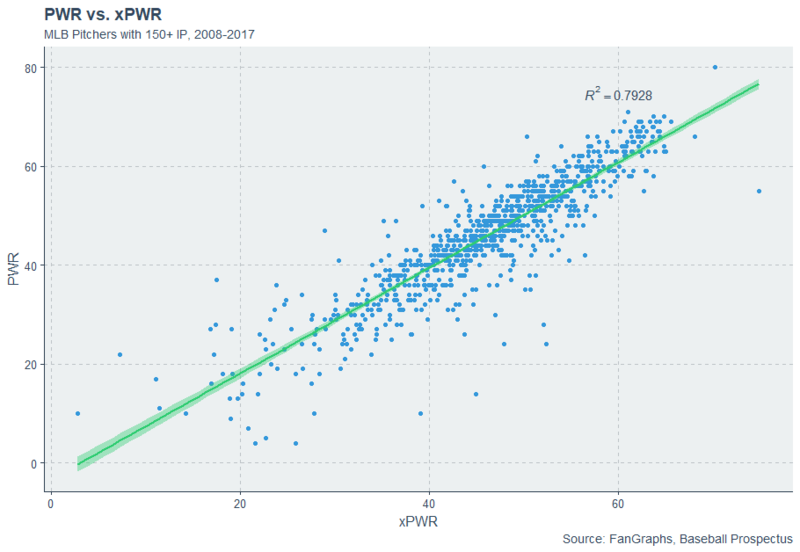 I plotted my values (xPWR) against BP's (PWR) and they look reasonable, so I'll try to use xPWR to mess around and see if I can resolve PWR's Bartolo Colon issue while maintaining their current level of accuracy for evaluating actual power pitchers. I know that FB% is worth about one-third of PWR, and Bartolo is in a league of his own when it comes to FB%. Hence, the most likely culprit appears to be Colon's insane FB%. There have only been two seasons where pitchers threw 2000+ pitches in a season and posted an FB% above 89%, and both belong to Bartolo Colon - 2012 and 2016. Starters (and to a large extent, relievers) do not typically rely upon their fastballs so much, and since Colon is such an outlier, using normalized scores makes him stand out in a big way. The closest any starter came to Colon's crazy FB% values was Henderson Alvarez in 2014 (82.7%), so Colon receives a (rather unfair) bonus in PWR scores for throwing so many fastballs, one that makes up for his lack of velocity. Note that I scaled the original values to best match the scale of PWR. Colon has (rather ignominiously) dropped out of the top ten, with his xPWR (v2) falling all the way to 45 - the same as John Lackey and Jake Odorizzi. The leaders in xPWR (v2) all fit the profile of a power pitcher - hard throwers, fast offspeed stuff, rely heavily on the fastball - and Colon can't cheat the metric as much. ... and relievers with 40+ IP. And what of our good friend Bartolo? Colon's xPWR (v3) score falls around 47, the same range as Kyle Gibson and Felix Hernandez. This third method gives us a lot less range in terms of scores, so it's more difficult to differentiate between players - but at the same time, it does just as good of a job of identifying pitchers who fall into the power-pitcher archetype while leaving out those who are not. Is PWR "broken" in its current state? Of course not. Almost every metric has a few players who can cheat it one way or another - Colon happens to be extremely good at cheating the PWR metric. With a couple changes, however, BP might be able to keep Colon from breaking into the top ten with a ridiculous PWR score while maintaining the integrity of the metric as a method of evaluating how well pitchers fit into the PWR archetype. Update: I talked briefly about this with Jeff Long at BP on Twitter. Long said that the metric was working as intended in that the metric identified Colon's approach as representative of a power pitcher. I would tend to disagree in that the key metric of power-pitching, velocity, is relatively absent from Colon's approach.